The All Assam Gorkha Students’ Union, Duliajan, took out a rally here on Tuesday to demand scrapping of the Citizenship (Amendment) Bill, 2019. The rally commenced at No. 16 Tiniali and culminated at the railway station in this industrial town of Upper Assam’s Dibrugarh district. The protesters raised slogans against the BJP-led governments at the Centre and the state. 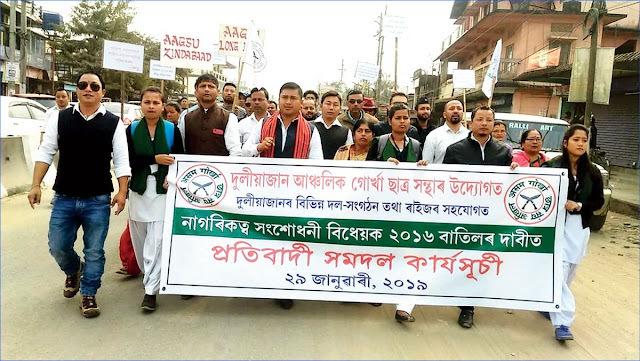 Its Dibrugarh district unit president Dipak Newar appealed to the people to cast their votes against the BJP in the ensuing Lok Sabha elections. “They may try to allure you but do not listen to their tempting words. If the bill is passed, the indigenous people of Assam will lose their identity, literature, culture, linguistics and existence. The demography of the state will change. I appeal to all to take to the streets to protest against the bill. The union’s adviser, Ajay Ale, said Assam cannot bear the additional burden of more illegal immigrants. If the bill is passed in the Rajya Sabha, lakhs of immigrants will settle here and the indigenous people of the state will be reduced to a minority. Debate on bill: Dergaon Kamal Dowerah (DKD) College in Golaghat district of Upper Assam is organising an all-Assam inter-college debate on the bill on February 5, during the birth centenary celebrations of a pioneer of the college, Noren Sarma, a freedom fighter and former MLA of Dergaon Assembly constituency, said. The topic of the debate is The Implementation of Citizenship (Amendment) Bill, 2016, Will Have an Impact on the Basic Structure of the Indian Constitution. The debate will be chaired by deputy inspector-general of police, Assam, and writer Abu Sufian. The convener of the debate, Dhiren Tamuly, told The Telegraph that the bill would be discussed in detail. “Participants from all over the state will have the opportunity to put forth their arguments for or against the bill,” he added. He said a two-member team — one for the motion and the other against it — from any institution affiliated to any recognised university in Assam can participate. The participants will be allowed to speak either in Assamese or English. The best three teams and two best individual debaters will get cash prizes and trophies. Interested participants may contact the principal or the convener for details. College principal Ranjit Kumar Bordoloi appealed to senior citizens and students to attend the debate and pay homage to Sarma.